Details: Also known as "The Pilot". Published weekly, every Thursday. 4 pages in length. Published on Grand Manan from 1876 to 1878. Details: Also known as "The Beacon" (after 1896). Continuation of the former "Bay Pilot" newspaper. Published weekly, every Saturday. 4-8 pages in length. Publication Dates: 1860? to 1865?? Details: Published weekly. A continuation of the "Provincial Patriot"
Publication Dates: 1831 to 1844? Details: Published weekly, each Sunday. Details: Published weekly. Early editions are more fishing industry based but the newspaper later becomes more of a community newspaper. Details: Published weekly, every Friday. 8 pages in length. Subscription based, $1.00 per year. Details: Continuation of "St. Andrews Herald and Commerical Advertiser". Also known as "The Herald". Publication Dates: 1819 to 1823/25? Details: Renamed after 1825 as the "St. Andrews Herald". Publication Dates: late 1990s to 2006? Details: Published bi-weekly, distributed within Charlotte County. Color. Details: Free of Charge; Classified/Personals; Former known as the "Dollar Strecher; Publishes several seasonal/trade issues per year; Little benefit to genealogy research but could be of use for business histories. Details: Published weekly. 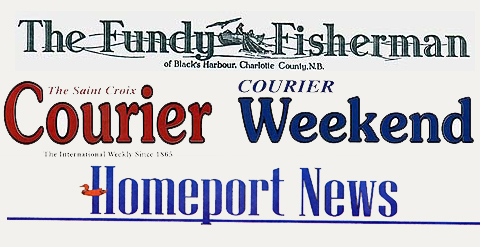 Absorbed by "Saint Croix Courier"
Details: Also known as "Provincial Patriot and St. Stephen's Banner". Continues post 1860 as "Charlotte Advocate". Details: Possibly only 1 printing then renamed/continued as the "Saint Stephen Times". Published weekly. Details: Published weekly, every Wednesday. 4 pages in length. Former in 1833, the same year as the closure of the "St. Andrews Herald". Details: Charlotte County's longest running newspaper! Also known as "The Courier". Details: Ended in 2001. Weekend edition of Courier. Contained entertainment/tv guide. Details: Continued by "The Granite Town Greetings" newspaper. Details: Published weekly. Previous published as the "Schoodic Times".